"Ten thousand years will give you such a crick in the neck!" 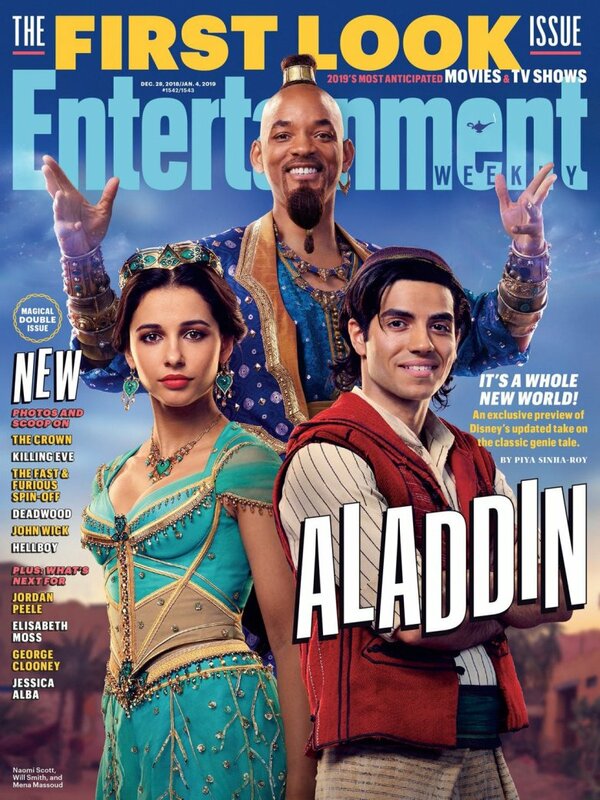 Entertainment Weekly finally let the "ever-impressive, the long-contained, often imitated, but never duplicated" Genie of the lamp out of his itty bitty living space on Wednesday, December 19, sharing the first photos of Will Smith in character as the magical, mystical creature for Disney's live-action Aladdin remake. Rather than appear as a larger-than-life supernatural force with royal blue skin and a swirl of smoke where legs should be, Smith is seen in the EW-released images in human form. Standing behind British actress Naomi Scott (Power Rangers, Charlie's Angels reboot) as Princess Jasmine and Mena Massoud (Jack Ryan) as the street-rat-turned-fake-prince Aladdin, he smiles wide while rocking an ornate vest-shirt combo, a voluminous goatee, a hoop earring on his left ear, and a decorated ponytail that sits in the middle of his almost-completely-shaved head. That's just on the cover of the latest issue of Entertainment Weekly magazine, though. Flipping through the pages to the central story of the issue, readers can see another snap of Smith's Genie — this time facing Massoud's Aladdin in an action shot. The pair — Genie seen laying on his stomach, propped up on a stack of pillows, talking with his hands and appearing to give Aladdin a lecture of some sort — look locked into the scene that likely comes at the start of the film, as Aladdin isn't yet in his Prince Ali get-up. You don't have to be a huge Disneyphile or a fan of animated movies or even all that familiar with Disney's original Aladdin from 1992 to know that, apart from the facial and head hair and choice of attire, Smith's iteration of Genie doesn't look exactly like the cartoon one the late Robin Williams voiced — at least not in these first-look images. EW noted that the Aladdin crew hasn't polished up character's final form as the big blue CGI guy just yet, but it will appear in the theatrical cut of the film. According to director Guy Ritchie, who revealed that he "wanted a muscular 1970s dad" for the character's design, Smith's Genie will make a massive impression. "He was big enough to feel like a force — not so muscular that he looked like he was counting his calories, but formidable enough to look like you knew when he was in the room," Ritchie said. Of course, the filmmaker doesn't believe that Genie's looks alone will capture audiences; the director told EW that the character's personality, elevated to new heights and spun out with fresh flair thanks to Smith's talents, is what viewers will adore. He also teased that Smith's take on the lamp-trapped high power is "more self-aware" than Williams' was in the Ron Clements and John Musker-directed original. "I like the fact that our Genie has an ego and is a little bit vain and he cares about how he's presented because he's been doing this for a very long time," he shared. "The great thing about the role of the Genie is that it's essentially a hyperbole for who that individual actor is, so it's a wonderful platform and tapestry for an actor to fill his boots on." 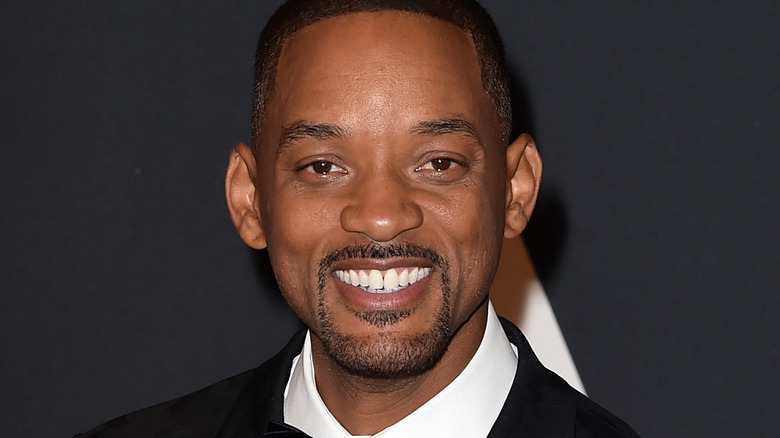 As for Smith, he admitted that it was nerve-wracking to step into the role that the legendary Williams originated and infused "with a timeless version of himself," but is still confident that he brings something special to the character. Williams made Genie his own, and Smith ventured to do the same. "Whenever you're doing things that are iconic, it's always terrifying," Smith said with a laugh. "The question is always: Where was there meat left on the bone? Robin didn't leave a lot of meat on the bone with the character … I started to feel confident that I could deliver something that was an homage to Robin Williams but was musically different. Just the flavor of the character would be different enough and unique enough that it would be in a different lane, versus trying to compete." 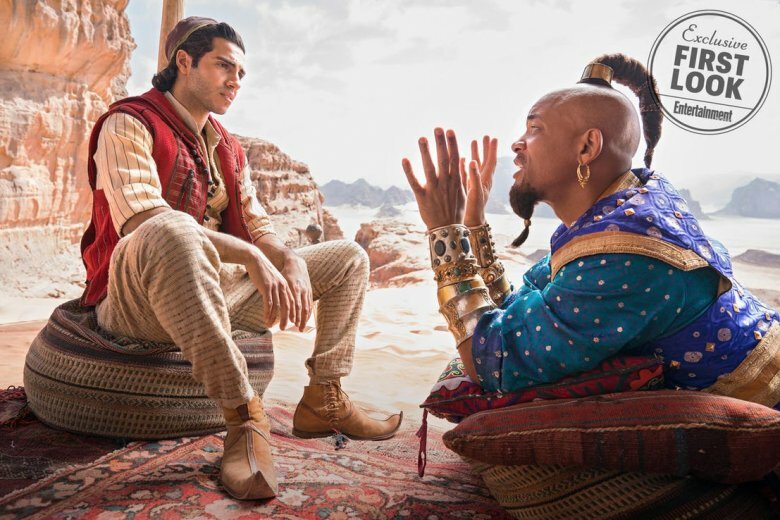 He then hinted that the live-action Genie, described by one Disney higher-up as "part Fresh Prince, part Hitch," will feature style and flair: "I think it'll stand out as unique even in the Disney world. There hasn't been a lot of that hip-hop flavor in Disney history." Seeing a non-blue Genie on screen might be strange for some viewers, but Ritchie's decision to keep his foot off the gas and not go H.A.M. with special effects for the character is probably for the better, as we all know how easy it is for bad CGI to ruin a great movie. Fingers crossed that the final design ends up looking wonderful, and that it's well-received in the promotional push leading up to Aladdin's release on May 24, 2019.